A Monte Carlo simulation is a method of finding an answer to a problem by repeatedly and sampling something at random. They are primarily suited to problems where a deterministic algorithm might not be practical or even feasible. From a financial perspective, Monte Carlo simulations are an effective way of modelling behaviours that have a degree of uncertainty, which can range from calculating option prices to running risk simulations. If we consider a unit circle (a circle with a radius of 1) inscribed within a square (making the square 2 units wide) we can show that the ratio of the area of the circle to that of the square can be used to find the value of Pi. We can create the following ratio between the two areas, and substitute our values in. So now we can see that by finding a value for \(R\) we can find a value for Pi. Using Monte Carlo simulations can provide a simple way of calculating a value for Pi. Monte Carlo simulations rely on random sampling, and in this simulation we're going to randomly pick a coordinate in the original square. 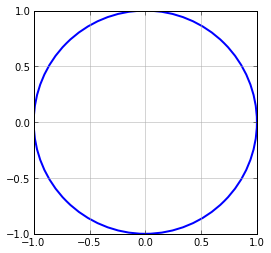 By keeping track of how many times we find a point that falls inside the circle, we can start to approximate \(R\) . The image above illustrates what is happening in this simulation. 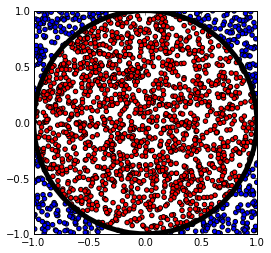 The ratio of the number of red dots to blue dots approximates the ratio of area of the circle to the area of the square, which gives us \(R\) . As you can see from the table above, our estimations of Pi eventually start to converge on the real value of Pi. However, increasing the number of simulations increases the time it takes to complete.